Chelsea strolled to a 4-0 win against Atletico Madrid last night in Matchday 3 of the Champions League. 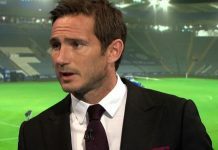 A brace from Salomon Kalou and a Frank Lampard drive from the edge of the box put the Blues in complete control before Atletico defender Luis Perea put through his own net in injury time to wrap up the scoring. The result leaves Chelsea top of Group D with a maximum 9 points. It was actually the visitors who made the brighter start, creating two excellent opportunities in the opening ten minutes. First former Manchester United striker and current Golden Ball holder Diego Forlan had a near-post header expertly saved by Petr Cech, before Sergio Aguero ran free on goal only to fire into the side netting. Chelsea had the ball in the back of the net after 12 minutes, only for Lampard’s free kick to be disallowed for offside against the loitering Kalou. Madrid keeper Asenjo had let the ball slip calamitously through his grasp. Kalou was in the thick of the action again three minutes later. Deco and Ballack combined superbly and the latter squared the ball to an unmarked Kalou 14 yards out. With the goal at his mercy the Ivorian could only drag the ball wide of the far post, much to the amazement of those inside the Bridge. Atletico continued to look dangerous going forward and Forlan’s dipping volley was well parried by Cech. However the struggling Spanish outfit, battered 3-0 on Sunday by Osasuna, looked woefully inept at the back and it seemed only a matter of time before Chelsea broke the deadlock. Kalou had a deflected shot well saved by Asenjo before the Ivory Coast striker eventually broke the deadlock. A sensational disguised pass from Lampard released the marauding Ashley Cole and his cross was emphatically smashed home by Kalou. His and the team’s relief at finally finding the back of the net was evident. The second half began as the first had ended, with Chelsea in full control. The probing and hard working Nicolas Anelka had a thunderbolt shot from the edge of the box well saved. Then, after 51 minutes, Chelsea and Kalou doubled their tally. A Lampard corner was met by the rising Kalou, who placed his header into the ground and saw it nestle in the corner. An evening that had started so poorly for the striker was now looking extremely profitable. By now the battered and beleaguered Spanish outfit’s heads began to drop, and bar a couple of decent stops from Cech to prevent Aguero and substitute Maxi Rodriguez they offered little going forward for the rest of the game. Instead it was Chelsea who upped the tempo, and sensing blood they added a third. Anelka had done well to win a free-kick on the left hand side, and played it short to the nearby Lampard. He exchanged passes with Michael Essien before firing a low shot from the edge of the box past the hapless Asenjo. It was the midfielder’s first goal since August 18th and propelled him into the top five Chelsea goal scorers of all time. Ancelotti greeted the third goal with a flurry of substitutions, giving Champions League debuts to both Daniel Sturridge and Yuri Zhirkov, and replacing Cole with Florent Malouda. It was Malouda’s dangerous free-kick in time added on which created the fourth and final goal of the evening; with Ballack lurking the helpless Perea could only manage to divert the ball beyond Asenjo and round off another disastrous evening for Atletico Madrid. Chelsea should be buoyed by their performance, however. Not only did they keep a clean sheet but they were also a little less profligate in front of goal than recent games, with only five shots on target resulting in four goals. Knowing that a win in Madrid in a fortnight’s time will guarantee them progression from what looked like a potentially tricky group can only add to the heightened optimism which surged around the Bridge last night.